Put the words beauty and kitchen together and odds are you will think of things in your kitchen that you could add to your beauty regime. Hali Bernstein Saylor/Boulder City Review Heather Marianna created Beauty Kitchen after launching a successful YouTube video series featuring her homemade beauty tips. Hali Bernstein Saylor/Boulder City Review Natural and organic soaps; skin polishes; lip, eye and face gels; lip balms; and bug sprays are among the many products offered by Heather Marianna's Beauty Kitchen in Boulder City. That’s at least how Heather Marianna started her company, Beauty Kitchen, which now has a retail shop and manufacturing facility in Boulder City. In 2012, Marianna gained fame through a series of videos on YouTube in which she demonstrated how to overcome beauty blunders and create spa products using items such as fruits regularly found in the kitchen. The following year she began to turn her home concoctions into products for sale, and in 2014 and 2015 she added spa products to her line. Her company grew as she continued making appearances on reality TV shows and providing items for celebrity “swag” bags. Currently, her line include soaps, bath bombs and soaks, shower gels, skin polishes, anti-acne items, eye gels, lip balms, and face and lip masks. They come in a variety of scents as well as purposes, such as anti-aging, plumping or skin brightening. She even offers an all-natural bug spray. Because her products incorporate fresh, natural, organic ingredients, Marianna said they have a shelf life of about one year but are better when used shortly after they are made. This also enables her to create seasonal scents, such as Fall in Love with Fall orange clove skin polish and Pumpkin Pie hand sanitizer. In addition to working hands-on with production, Marianna travels throughout the country to source raw materials for her products. Maintaining quality is important to her, she said. “I really like what I do,” she said of her busy schedule that has her working practically nonstop. And that’s perfectly fine with her. “If you like what you do, it’s never work,” she added. Calling herself an entrepreneur by nature, she had a boutique selling accessories for dogs when friends urged her to start selling her homemade beauty products. 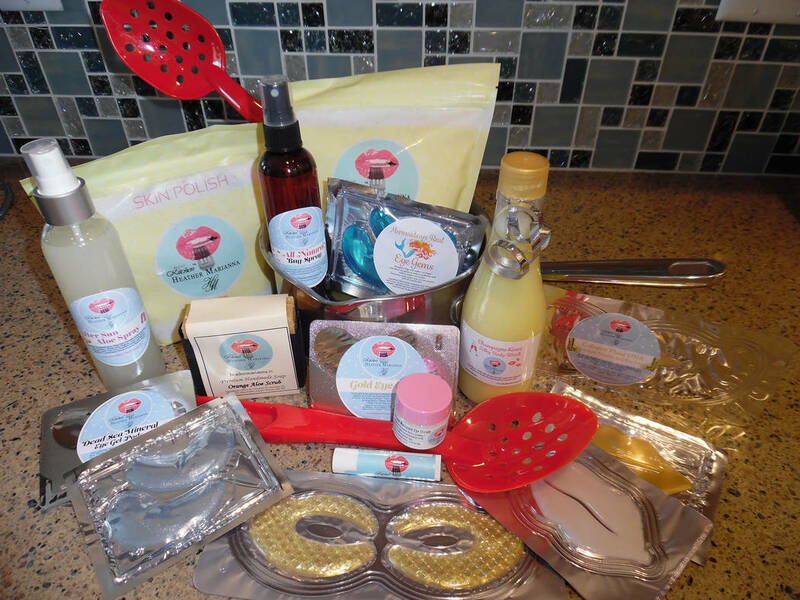 Beauty Kitchen offers the ability to custom make perfumes and room sprays, and it hosts spa parties where guests can make their own products to take home. Lindsay Feldman said Marianna created custom pink bubble gum-scented bath soaps for her Barbie-themed baby shower. With her small staff, Marianna keeps her store stocked, hosts private events, runs an online outlet for products and creates private-label items for area hotels, spas and special events. Beauty Kitchen offers monthly home delivery packages as well. Everything she sells is handcrafted in her warehouse/retail outlet on Industrial Road, which she opened earlier this year. She was so enamoured with the city that she didn’t even wait to find a home until she opened her business, living in her shop for a while. The shop, done in a plush decor, offers branded apparel such as tank tops and robes, T-shirts and onesies for babies. Personal accessories and home accents also are available.